Learn how to cook sweet potatoes in 6 easy steps. So you found a great deal on a pressure cooker that your friends have been raving about. Now what? What is a pressure cooker?How does a pressure cooker work? Hungry for a home-cooked meal but lacking in the time? An electric multicooker, which can act as a pressure cooker, slow cooker, rice cooker and steamer can help. Although the Instant Pot is one of the most popular multicookers on the market, there are other good brands out there as well. How do you get the most out of your pressure cooker? Keep reading! What is this multicooker that you speak of? It’s a pressure cooker, utilizing pressure and heat to prepare food evenly and quickly, usually in a fraction of the time of traditional methods. It can also function as a slow cooker, allowing you to take your time if you aren’t in such a rush. It can sauté and steam with a built-in heat source at the bottom of the machine. This means you can use the pot to sear meats, sauté vegetables, steam rice or even simmer liquids for steaming without using a stove top. Old style stovetop pressure cookers have a gauge on the lid that pops up as the pressure increases, meaning that the inside of the pot has reached optimal pressure. The heat needs to be adjusted to keep the pot’s temperature and pressure constant to avoid over-pressurizing which can burn the food inside, or in extreme cases, explode. An electric pressure cooker traps steam rising from the boiling liquid within the pot, which raises the temperature at which that boils. It can work at different pressure levels with a steam valve that allows excess steam to escape, keeping the pressure cooker from exploding. It will also turn itself off if the pressure or temperature ever rises too high so it’s another wonderful tool to have in your kitchen that you can set and walk away with little worry. To use your electric pressure cooker, review your recipe to determine the pressure level – high pressure is used for many recipes, but low pressure is used for more delicate items like seafood, rice or eggs. Some pressure cookers even have a setting for different proteins. Set your steam valve and once you set your device, it will begin building pressure (pressure cannot build if the device is venting). Pressure build up can take up to 20 minutes. Once the cooking time is up, the multicooker will automatically change to “keep warm” function and begin slowly losing pressure. It can take up to 30 minutes to release naturally. The longer the pressure cooker has been on and the more food it has in it, the longer the natural release will take. If the recipe calls for an immediate manual release, carefully move the steam valve to the venting position and the pressure will release in a minute or so, with a burst of steam. Keep your hand away from the top of the valve – you may consider using tongs or a wooden spoon to move the valve or covering the valve with a dish towel to keep the steam from spraying all over your kitchen. 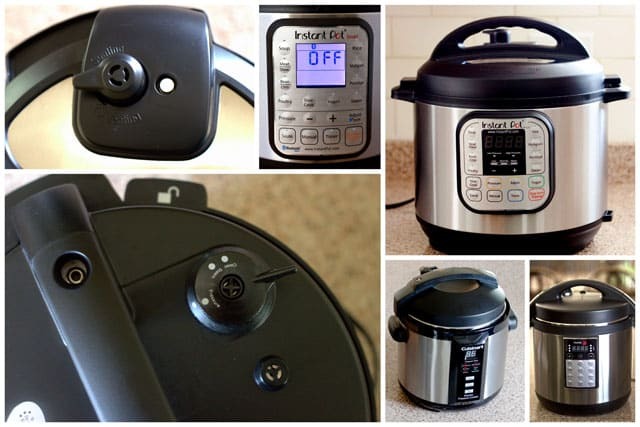 If you are tight on space, you can replace your slow cooker and rice cooker with a multicooker since it can handle slow cooking, pressure cooking or steaming methods at the touch of a button.